A big story has developed in the last decade: Silicon Valley and the car business are converging — high-tech code meets heavy metal. 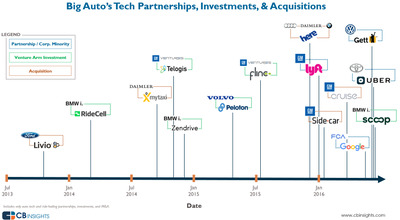 You can see that since late 2015, the density of these collaborations, partnerships, investments, and sometimes outright acquisitions of tech companies by old-school car makers has increased. Why? It’s simple: the General Motors, Fords, and Toyotas of the world are making a lot of money right now, as auto markets boom. And they’re taking their profits and investing in an uncertain future, but one whose shape is becoming more clear. The trend is that city dwellers are increasing the pace at which they use ride-sharing services such as Uber and Lyft. Urbanites haven’t traditionally been good car customers, because the don’t need vehicles. But they do need transportation. And so traditional automakers are striving to bring them into the fold, as well as avoid being left behind if, say, Uber gets really big. The trend is already accelerating. Expect it pick up even more speed in the years ahead. And there’s more: self-driving cars are happening much faster then anyone expected. 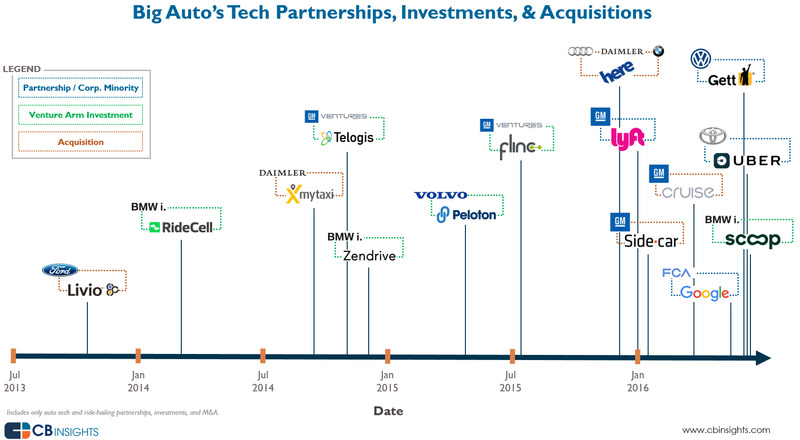 So automakers are also getting aggressive about acquiring and investing on that front.